On Saturday 14th October 2017, the members of Downshire Brass made their annual trip to Armagh for the NIBA Championship of Ireland Band Contest. This year marked the 100th contest for the NIBA which made the event extra special. Before the senior band took to the stage in the early evening, the youth band performed Malcolm Arnold’s ‘Little Suite for Brass’ just after lunch– and what a great job they made of a tricky piece! They were later announced as runners-up in the section following a splendid performance by the 1st Old Boys Youth Band. Thank you to all the youth band parents for your support. After cheering on MD Michael Alcorn with Lourdes Brass Band and associate conductor Wesley Thompson with Comber Silver Band in the Second Grade Brass section, it was the turn of Downshire’s senior band who performed the set work ‘Salamander’ by John McCabe. The band had been drawn to play first in the section and some members enjoyed a well-earned rest following the performance while others took the opportunity to listen to the other performances in the section. Downshire was delighted to come away with 2nd place finish and most of the band headed back to Belfast for some light refreshments! 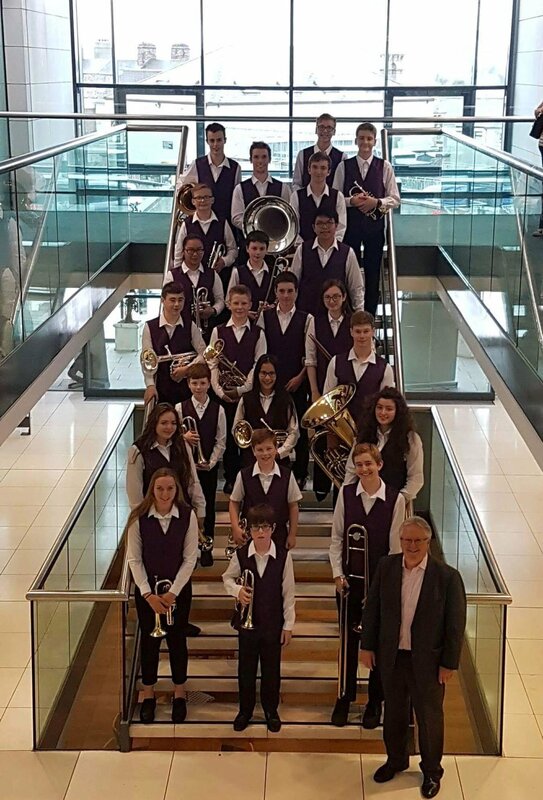 Many congratulations to all of the prize winners with a special mention to the 1st Old Boys Silver Band who will be representing Northern Ireland at the European Brass Band Championships in Montreux, Switzerland in 2019. As always, Downshire Brass would like to thank Michael for all of the work that went into preparing both bands for the contest; our guest players for the time and commitment they gave in the weeks leading up to the performance and to the NIBA Executive for another great contest day. Finally, well done to all the bands participating in the contest this year, as mentioned on the day, it is great that we are celebrating 100 years of NIBA contesting! Downshire has a busy few months ahead preparing for the Festival of Brass contest in November and lots of events over the Festive season. Keep up-to-date with forthcoming events via the website or Facebook page!